The Mayor, Councillor Linda Wallraven has now chosen her charities as Seaford Museum & Heritage Society and Teddy Treats during her time in office throughout 2018/2019. The Mayor is pleased to be able to support these local charities and said “I am pleased to announce that I have chosen two charities for my Mayoral year, which are Teddy Treats and The Seaford Museum & Heritage Society, two very different charities. 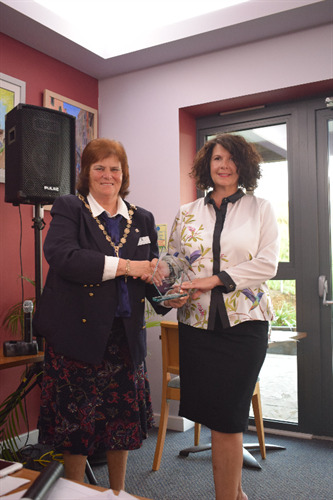 Kay Turvey, Chairman of Seaford Museum & Heritage Society tells us how they reacted to the news of being one of the Mayor’s chosen charities this year, “The Museum Trustees and I were delighted and honoured to be chosen as one of the Mayor’s chosen charities for 2018-2019. Although we have been fortunate in receiving grants from the Keith Baker Trust and the Heritage Lottery fund to provide access for those with mobility problems, the concomitant costs of moving and replacing/rebuilding half our displays and refitting our entrance floor have been high. Without our team of hardworking volunteers doing as much work as possible in-house they would have been prohibitive. We have also lost 6 months income from visitors, so this money will help us to continue to improve our displays, particularly signage and interpretation panels to add to the visitors’ enjoyment”. Brenda Edwards, Founder of Teddy Treats said “We are absolutely overwhelmed to be selected as one of the Mayor’s chosen charities for 2018-2019. We were lucky enough to also be chosen as the Young Mayor’s chosen Charity a few years ago. The money given allowed us to host a Christmas Magic Party for the children. We still remain small and run purely with the help of volunteers providing treats for local children who may be unwell and/or families who are in need of support. Teddy Treats is non-profit and works closely with support groups within the town. This fantastic opportunity allows Teddy Treats to expand the Christmas Toy Bank where we buy/donate new toys via our local Seaford Foodbank helping local families in need of support by ensuring the children and young people have toys/treats at Christmas. We have theatre trips twice a year for local children which is such a lovely treat. We will also be able to further advance ‘Teddy Treats Top Talent’ yearly sponsorship programme working with local businesses supporting young people in the town to continue or start a creative/sports activity which for whatever personal reason are unable to do so. It is so important for young people to have the opportunity to be creative and ‘Top Talents’ enables young people to continue with their hobby/passion developing their talent. We are so grateful to be chosen and look forward to working with Mayor Linda Wallraven. Thank you”.